I subscribe to the Little Inn of Bayfield’s e-newsletter, and this past January I saw that the Inn was offering a great winter deal as part of their 182nd anniversary: stay in the room of your choice, $50 dining voucher and full country breakfast for $182 for two people! Since February 14th was coming up, I treated my Valentine to a great getaway that wasn’t far away from home, but was a nice change of scenery. We both had never stayed at the Little Inn before, so it was a new experience for us. 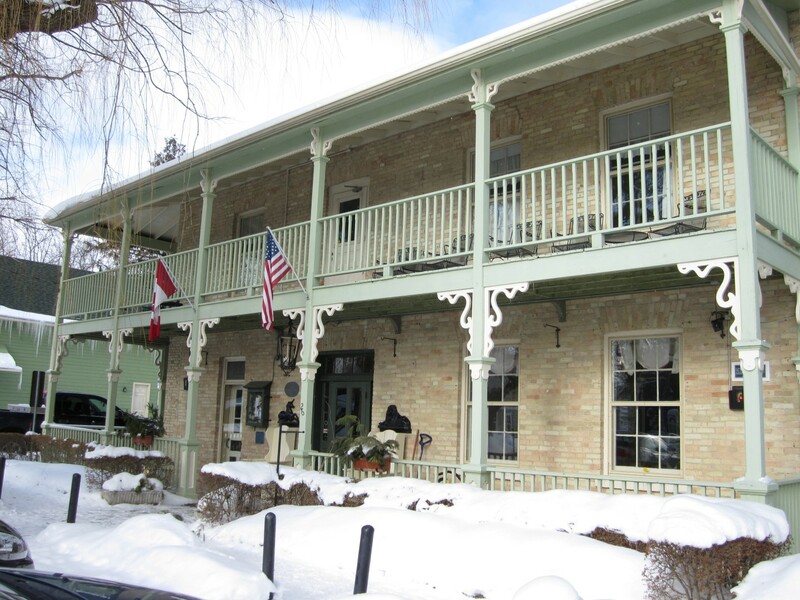 The Little Inn of Bayfield has a CAA Four Diamond Award for lodging and dining and it’s Ontario’s longest continually operating inn. Wow! We arrived early for the snowshoe adventure (see my last post for details), and the reception staff was very friendly and welcoming. There were guests milling about, some enjoying coffee and a good book in the front parlour by the fireplace, and others enjoying a late lunch in the dining room. Innkeper Darren Erb led us to one of the Carriage House rooms which is a bit more spacious than the Original Rooms. Room 31 featured a queen size Tempurpedic bed, small sitting area (complete with mohair throw from the Old Mill in Blyth), ensuite bathroom with standup shower, and view to the historic Main Street. The bed with custom made duvet was very comfy, although it was so high you literally had to climb up into bed (there were actually stools provided!). Two heart-shaped sugar cookies were waiting on the bed upon arrival, which was a nice treat after snowshoeing. For dinner we enjoyed Lake Huron fish and chips and mushroom risotto, as well as a warm apple tart with chocolate ice cream for dessert in the Carriage House dining room. Nearby in the Original Inn dining room guests were enjoying an Around the World Wine and Dine event featuring food and wine pairings from all over the world. If we weren’t so stuffed, we would have tried the Hayter’s Turkey Poutine which was made with gnocchi fries, devils rock blue cheese, chive seedlings, turkey veloute…sounds yummy and interesting! I especially enjoyed their speciality tea after dinner, which was a decaf vanilla blend. The Inn also shares some of their favourite dining room recipes on their website. There were couples young and old, and even families with small children (they have a children’s menu) enjoying dinner in the dining room. The little girl next to us so well behaved and was quite entertaining: at the end of dinner she put her utensils “to bed” under her napkin! What was nice was that throughout the meal our server explained the ingredients and how the food was prepared, and we didn’t feel rushed even though we spent over 2 hours enjoying a candlelight dinner. Breakfast was a continental buffet of cereals, fruit, yogurt, breads, jams, and juices as well as an item off the hot breakfast menu. We enjoyed the French toast and Spanish omelet and we were quite full by the end! I especially enjoyed the homemade banana bread and local coffee from the Coastal Coffee Company. The Little Inn features locally grown and raised products from Huron County, as their breakfast featured sides of Exeter tomatoes and Metzger’s bacon and sausage. 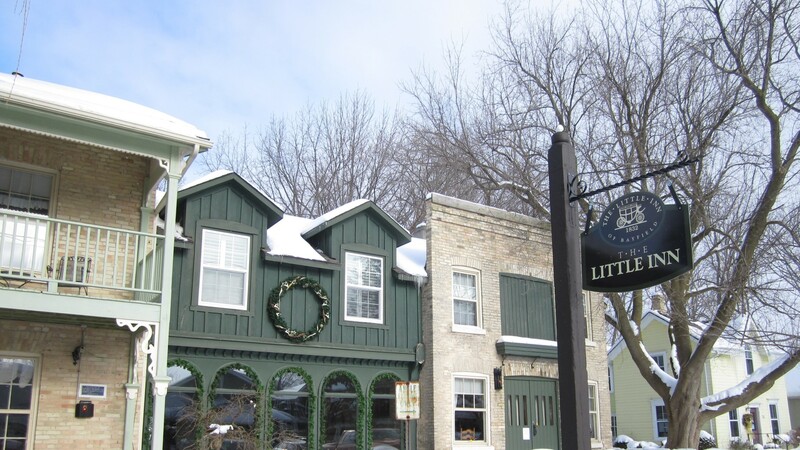 The LittleInn is quite charming with its antique furniture, traditional decor, and friendly service, so it’s nice to see that it is still operating since 1832! Every January they close for their annual “winter’s rest” where they give the Inn a facelift such as refinishing the original wood plank floors in the dining room. While it is a historic Inn, it still offers much of the same modern amenities as other inns and hotels (such as free wireless internet), and it’s evident that they maintain the Inn without sacrificing its original character. I thought with the older plumbing, the shower would be just lukewarm, but it was the hottest water I’ve ever experienced! This package was a great deal and it shows that you don’t have to spend a small fortune to stay in a beautiful historic Inn. Considering that the cost for the room was slightly over $100 with the breakfast and dinner amounts removed, I think most would find it difficult to get quality accommodations elsewhere at that price. Along with the great price, parking was nearby and free, shopping was literally down the street, and the service and charm was much greater than what you’d find in the city! Check out their Facebook and Twitter pages for deals and specials!